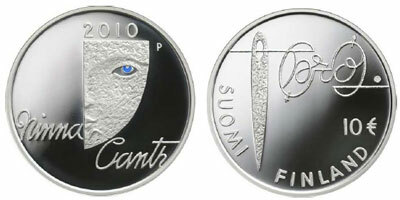 The Mint of Finland has issued a new €10 silver coin to mark “Minna Canth and Equality.” Minna Canth was the first woman in Finland to be awarded her own national flag day. She was considered a versatile talent, both as a writer and as an opinion leader in social affairs. The obverse of the coin shows one side of a woman’s face superimposed with handwriting from Canth’s descriptions of the fate of women from her extensive dramatic works. The reverse depicts a needle which is in the shape of the symbol of womanhood. Through the eye of the needle is a thread of her written texts forming an image of equality. The silver collector coin has a nominal value of 10 euros. Its diameter is 38.61 mm, it weighs 25.5 g, and the maximum mintage is 20,000, of which 14,000 in Proof quality and 6,000 in BU quality.